New Year's Eve is the perfect time to hit the road and explore Australia. 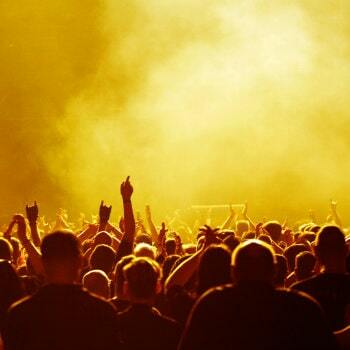 From the amazing music festivals that Australia does so well to the abundance of scenic locations that span across this amazing country, there's an endless list of epic things to do this New Year's Eve. Looking for ideas? VroomVroomVroom brings you the best road trip destinations to celebrate New Year's Eve. Looking for an amazing place to celebrate the New Year but hate big crowds? 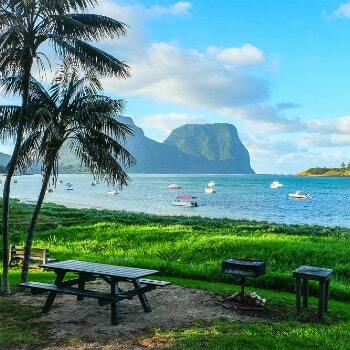 Lord Howe Island may just be the perfect place for you. It gets even better… Do you want to be one of the first people to see the sun on New Year's Day? This location is one of the first places where the sun rises! Hike the amazing volcanic ridges, relax by the beach, snorkel, and discover the abundance of wildlife right here on Lord Howe Island. The great thing about this place is that there is a limit of 400 people here at one time, so you can rest assured in peaceful tranquility this New Year's Eve. Where to stay? There are many lodges you can stay in on the Island itself ranging from budget-friendly to high-end options. Getting there: You can pick up your car hire in Sydney and explore the area. From there you can catch a 2-hour flight from Sydney to Lord Howe Island. For a New Year's Eve to remember, Mitchell Falls is the perfect place to go camping with friends and family. The Mitchell Plateau is a stunning waterfall that is situated in Kimberley in Western Australia. Amazing for swimming, exploring, hiking and relaxing, this location is a nature lover's paradise. Popular things to do include hiking to the Mitchell Plateau, swimming in the countless creeks and falls, and exploring the stunning flora and fauna. Where to stay? There is a large campground at the beginning of the walking trail to Mitchell Falls. 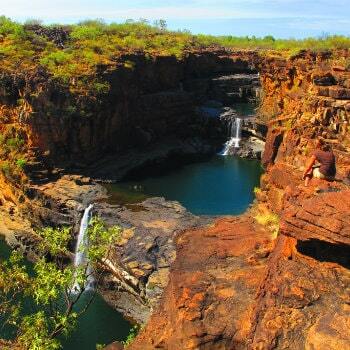 Getting there: You can road trip from Darwin to Mitchell Falls. Follow National Highway 1 to the Great Northern Highway in Lake Argyle. Take Gibb River to Wyndham Road and Gibb River to Kalumburu Road to your destination in the Mitchell Plateau. What better way to bring in the New Year than in Byron Bay listening to amazing music! Byron Bay is an iconic beach town on the East Coast of Australia. Summer in Australia can be perfectly spent by the beach throughout the day and listening to amazing music stretching into the night. Nature lovers will also feel at home here with the range of national parks, beaches and amazing vibes. Where to stay? Summer in Byron Bay is quite popular, so it's recommended that you book in advance. The great thing about this location is the range of accommodation options - from campsites to luxurious homes. Getting there: You can fly into the Gold Coast and pick up your car hire from the Airport. From there you can drive south along the stunning coast following the ocean or take the Pacific Highway and follow the signs to Byron Bay. Just when you thought New Year's was a once-a-year type of celebration - it's possible to bring in the new year twice. Yes, you read that correctly! Start off your night in Tweed Heads in New South Wales and then drive across the border to Coolangatta in Queensland. Because each state is in a different time zone, when it hits midnight in Tweed Heads it will only be 11pm in Coolangatta. As long as you get across the border within the next hour, you will be able to celebrate the New Year twice! Where to stay? The choice is yours if you want to stay in Tweed Heads or Coolangatta. They are both situated near the beach and have many hotels that you can choose from. Getting there: Pick up your car hire at the Gold Coast Airport. 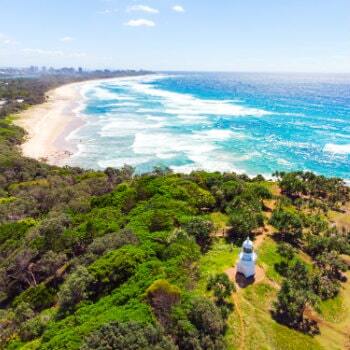 Coolangatta is where the Airport is located so you don't need to travel far to get to your destination. Known as the largest food and wine festival in Australia, the Taste of Tasmania is a mouthwatering festival that spans from Friday the 28th of December until Thursday the 3rd of January on the stunning Hobart waterfront. What better way to bring in the New Year than with friends, family and delicious food and wine? Sounds like a dream come true to us! On the 31st, there is also a Speakeasy Ball where you can be transported back to 1928 before you bring in the New Year. Where to stay? 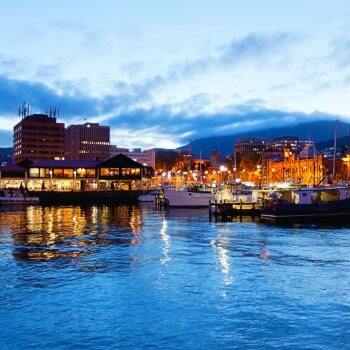 You can stay in the city of Hobart and drive to the the Taste of Tasmania from there. There are countless accommodation options depending on your lifestyle and needs. Getting there: You can fly into Hobart Airport and drive to Princes Wharf. After the Festival you can travel around Tasmania for the ultimate road trip.